FC AFC Sniksoh Spank's Hank "Hank" x FC AFC High Hopes Little Ann "Annie"
Annie delivered five health puppies (2 boys, 3 girls) on April 4, 2016. Annie and the pups are doing great. All of the pups are spoken for, but you can see pictures below. Allison and Dan met Hank at Gun Dog Nationals in 2015. After seeing him run, we knew he was a dog we really liked. Seeing his pedigree made the decision to breed to him easy. What was more difficult was making this breeding happen with Annie in Ohio and Hank in Colorado. Thankfully we were able to make arrangements with Hank's owner Jeff Hoskins and complete this cross-country breeding. We couldn't be more excited for these puppies. This breeding is a very nice line breeding with HOF NFC FC AFC Bean’s Blaze behind both dogs and appearing three times on the pedigree. 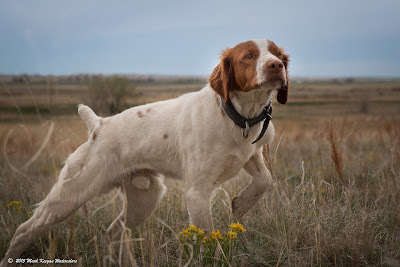 Both Annie and Hank are big running shooting dogs who started winning young and earned their Field Champion and Amateur Field Champion titles at the age of four. Hank brings a big, fast ground race and long stride that he uses to cross the prairies and deserts of Kansas, Colorado and New Mexico. He points high and tight with lots of style. Hank has that kind Brittany temperament we love. Annie is a big running shooting dog with a snappy ground race, long nose and beautiful style. We expect these pups to run big in the field but relax comfortably on the couch at the end of the day. The litter will be American Kennel Club (AKC) and American Field (AF) registered and ABC Futurity nominated. These two dogs are great dogs in the house and in the field and we expect the pups to be fast, big running, hard hitting gun dogs. See all of Hank's Field Trial placements here. 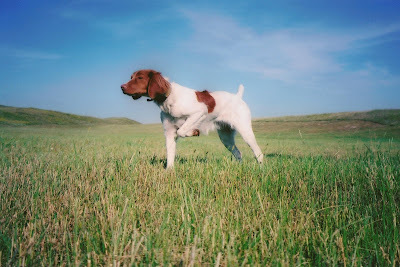 raising her second litter of puppies in 2015 (a breeding to DC AFC Grand Junction Jake that produced our Penny) Annie again qualified for Nationals and again took second place in the Amateur Gun Dog Championship. This amazing little dog just keeps getting it done and never ceases to amaze us with her intelligence and strength. This pedigree is an outcross of two exceptional dogs with amazing pedigrees. The parents and grandparents all earned at least an AFC title. HOF NFC FC AFC Bean’s Blaze appears behind both dogs and shows three times on the pedigree. We expect puppies with lots of point and style with the conformation and desire to run big and fast.